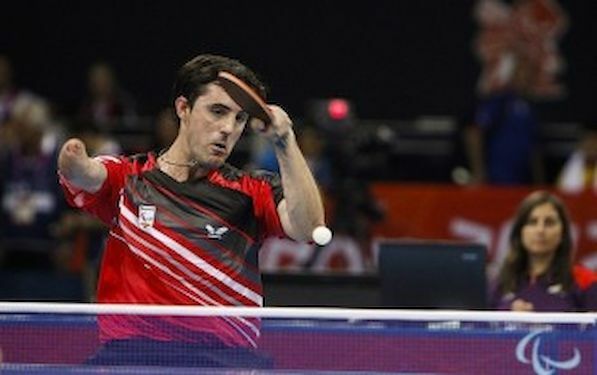 In the first stage of the Men’s Singles event at the GAC Group 2014 ITTF World Tour Spanish Open in Almeria, the host nation’s José Manuel RUIZ caused the biggest upset. Beaten by Scotland’s Craig HOWIESON in his opening contest, latter he beat Belgium’s Robin DEVOS, currently ranked at no.196 on the Men’s World Rankings and the eighth highest globally listed player on opening day duty. RUIZ won in five games to give himself a chance of finishing in first place in the group and thus progressing to the main draw. He was beaten by Craig Howieson by the very narrowest of seven games margins, so when Robin DEVOS of Belgium beat Craig HOWIESON, José Manuel RUIZ emerged at the top of the Group. Currently, José Manuel RUIZ has no World ranking; it is not that the fact he has been absent from the international scene, it is quite the reverse, he is very active. RUIZ is a Class 10 Para Table Tennis player, his right arm is severed at the elbow, exactly as is the situation with Poland’s Natalia PARTYKA. In the World of Para Table Tennis, José Manuel Ruiz has a wealth of experience; he has been competing internationally for two decades. Furthermore, he has enjoyed great success. Many times the national champion, he made his debut at the European Championships in 1995 in Hillerod, Denmark and since that time has been present at the vast major of major tournaments. He secured gold medals in Men’s Singles Class 10 at the European Championships in 2001 in Frankfurt and also in 2009 in Genoa, Italy. Furthermore, in Genoa he added the Men’s Team Class 10 title; whilst in 2007 in Kranjska Gora, Slovenia; he secured the top prize in Men’s Open Standing and in Men’s Team Class 10. Similarly at World Championships he has gold in his locker, in 2010 in the Korean city of Gwangju he won the Men’s Singles Open Standing Class. In addition he competed in the Paralympic Games in Sydney in 2000, as well as in Beijing eight years later and most recently in London in 2012. Gold has proved elusive but notably in Sydney he won silver in Men’s Singles class 10 and bronze in Men’s Team Class 10; in Beijing he was a silver medallist in Men’s Team Class 10, whilst in London in Men’s Team Class 9-10 he secured bronze. In the first round of the main draw, tomorrow, he will meet WONG Chun Ting of Hong Kong.